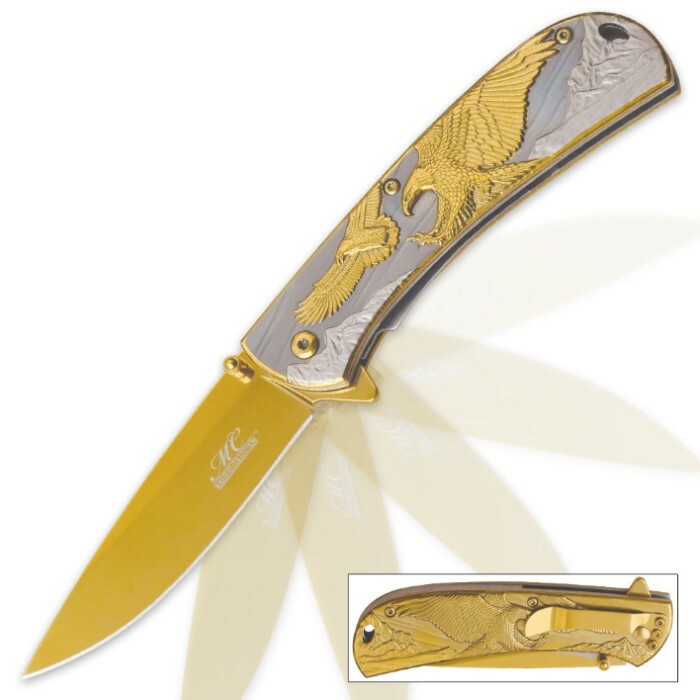 Masters Collection Gold Mountain Eagle Assisted Opening Pocket Knife | BUDK.com - Knives & Swords At The Lowest Prices! Includes gold pocket clip; closed length: 4 1/2"
The stunning Masters Collection Gold Mountain Eagle Pocket Knife is every bit as breathtaking as the American bald eagles and majestic mountain wilderness it depicts in delicate gold and silver relief. Sculpted in magnificent 3-D, the stainless steel handles portray two gleaming gold bald eagles, their imposing wings outstretched and stinging talons extended, soaring in the lofty heights above towering rocky peaks. The glittering gold of the eagles and rivets pairs exquisitely with the golden blade, while the mirror polished silver-colored handle background yields tantalizing contrast. 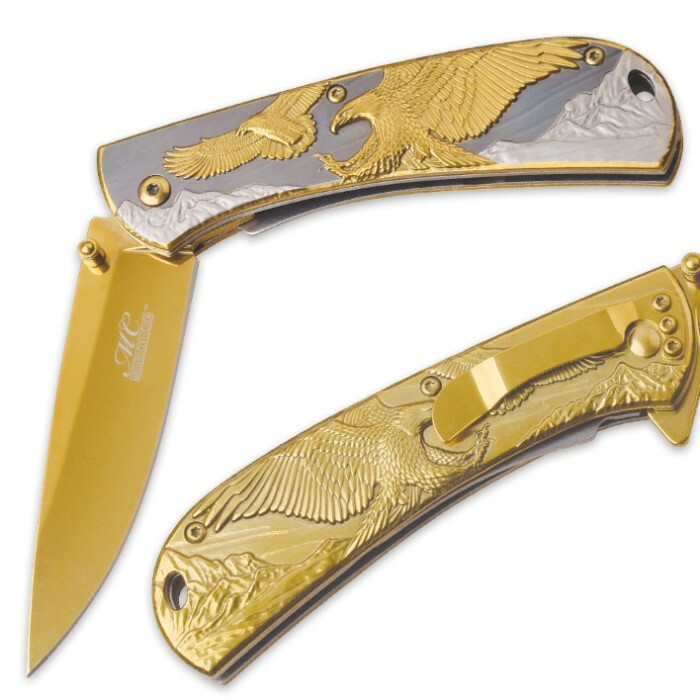 But don’t take the Gold Mountain Eagle Pocket Knife for granted on account of its astounding beauty; rest assured, it packs just as much brawn. Boasting a razor sharp 3 1/2” titanium coated stainless steel blade with an advanced assisted opening mechanism and liner lock, this chic pocket knife performs like a champ, whether slicing and cleaving its way through everyday cutting jobs or evoking awe and admiration in a collector’s display case. 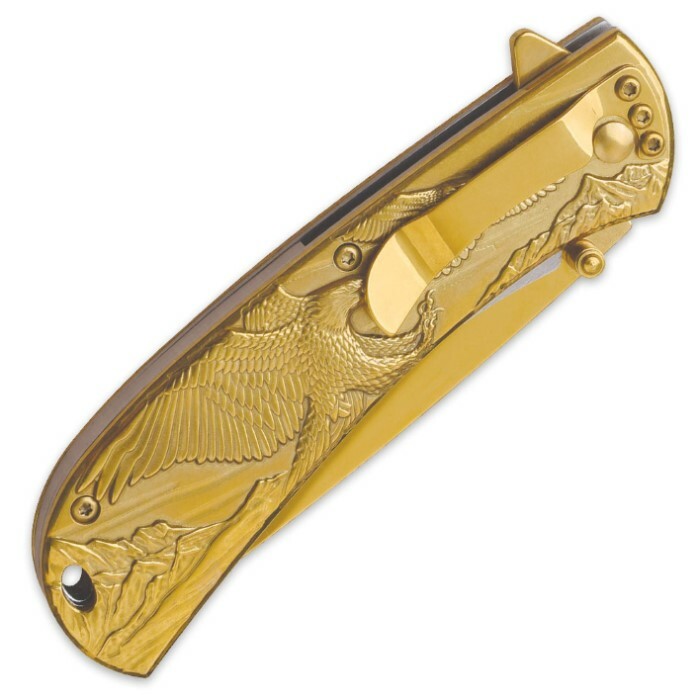 Likewise, the gold titanium-coated pocket clip is both handy and elegantly ornamental. A must-have for any collector. Also makes a terrific gift for blade aficionados, patriots, veterans, graduates, corporate events and more. Measures 4 1/2” closed.